A lost and lonely young man who has nothing to live for back home escapes to a gorgeous, sun-kissed Italian seaside town where he meets and falls in love with the girl of his dreams. Doesn’t sound much like a horror flick, does it? Truth is, horror is the most inclusive of all cinematic genres. 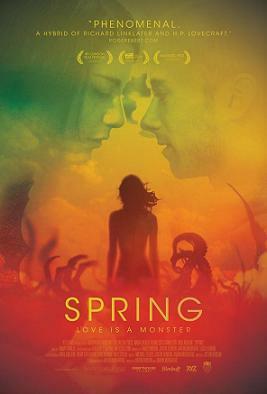 And while it’s most associated (and unfortunately derided by many) for its slashers and zombie gut-munchers, it’s also expansive enough to welcome in a genre-hybrid like Spring – a beautiful love story and meditation on mortality and life that also happens to be a pretty great horror film. As the story begins, Evan Russell is at his cancer-stricken mother’s bedside as she takes her last breath. After the funeral, Evan gets into a bloody brawl in the bar where he works. He loses his job and is sought after by the police. With nowhere to turn to and nobody to provide the solace he needs, Evan flees to Rome – a place where he and his deceased dad once planned on visiting. At a hostel bar, Evan meets a couple of drunken British hooligans who invite him to join them as they drive up the coast. Once there, Evan spots a vision in red sitting on a bench He later sees her again at a bar and strikes up a conversation. Her name is Louise and Evan falls for her fast and hard. She’s friendly but aloof, and is taken aback that Evan wants a date rather than a quick fling. When Evan’s traveling companions decide to move on to Amsterdam, he opts to stay behind. He takes a position as a farmhand in exchange for room and board. When he spots Louise next, he convinces her to go on a date. Louise is coy and guarded, but she ultimately lets her defenses down ever-so-slightly, and the two tentatively draw closer. They return to Evan’s and make love. However, at dawn’s break, Louise awakens looking like the undead – with protruding fangs, a pallid complexion, and veins pulsating throughout her face. She makes a quick retreat and Evan wakes alone. It’s very difficult to discuss a film like Spring without delving into heavy spoiler territory, so reader beware. Louise is an evolutionary throwback as old as Methuselah who transforms into different creatures at extremely inopportune times. Sometimes she appears vampiric; at other times wolflike. In the most striking transformation, she becomes a slimy, writhing, tentacled, Lovecraftian thing. She’s unable to predict the transformations but is able to halt them through injections of a serum of her own devise. The creature elements of Spring are jarring and horrific enough to appease horror hounds, but at its core, Spring is a love story and an examination of two lonely souls meeting and connecting. Both Louise and Evan have pain in their hearts and secrets in their past– it’s just that Louise has centuries worth more. How they navigate their courtship, both before and after Evan discovers her secret forms the backbone of this atypical film and gives Spring its tender, beating heart. Some might balk at Evan’s decision to stay with Louise after seeing her at her literal (monstrous) worst, but in the end, what is love if not seeing someone at their worst and accepting them still because you know what they are at their best. Metaphoric? Yes. Arty? Sure. But it works. Nadia Hilker as Louise is a revelation. She is beautiful, transcendent and mysterious. Hilker carries the burden of the film’s fantastic elements, yet she remains believable and true at all times. Hilker transcends what could have been a typical yet anachronistic “manic pixie dream girl” type – albeit an at times animalistic, at other times slimy and tentacled one – into a character that carries real weight and vulnerability. She is able to convince both Evan and the audience that she is the one worth keeping, even when her transformations require her to do some not so nice things. The cinematography is another aspect where Spring excels. Co-directors Justin Benson and Aaron Moorhead render Italy in lush, gorgeous, golden hues, expertly capturing the stunning vistas, architecture and the natural beauty of the Italian village. Just like Louise, the beauty and serenity of the setting belies nicely with the more sinister underpinnings of what is really lurking beneath the surface. Genre-hybrids like Spring are a very tricky proposition. The balancing of ingredients needs to be handled deftly, and in clumsy hands, neither genre comes off well and the result is something unpalatable. But when crafted delicately, a genre-hybrid can elevate and transcend both elements. Spring deftly handles both the romance and the horror superbly, and as such becomes something that is profoundly beautiful and uplifting. Highly recommended.